You developed and executed a successful communications campaign. The client loved it, the media was all over it, and – best of all – you far exceeded your performance goals. Yet it didn’t make the cut at the Worthy Awards. What went wrong? 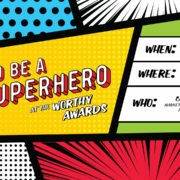 Carol Murray, APR, marketing communications manager for Blue Zones Project – Fort Worth, will discuss the critical components of an award-winning entry and share what went into “The Superpowers Campaign,” last year’s Best of Show winner at the Worthy Awards. Then hear some dos and don’ts gleaned from judging other chapters’ award entries.